What are the most popular online bachelor's degrees offered in Texas? Online learning requires a significant amount of engagement, and school administrators in Texas don't want students to wait until college to take an innovative approach to their own learning. The Texas High Performance Schools Consortium is backed by the state legislature and consists of 23 school districts. Its mission is to empower students to forge their own paths to success without relying too heavily on standardized tests and rote memorization. Texas is also a member of the Southern Regional Education board (SREB), which works with colleges, schools and state policymakers to improve education and give students what they want most. When community colleges across the state saw a dip in enrollment, many schools responded by expanding their online offerings. For example, online enrollment at Odessa College increased by 18 percent, according to Donald Wood, Vice President for Institutional Effectiveness. Students are catching on to the benefits of online learning quickly, but many still attend programs at in-state schools even though geography is no longer a factor. Of course, Texas residents who attend online programs in the state receive more than just reduced tuition; they also get legitimate credentials and a quality education that they completed at their own pace at home. Texas Tech University offers a large number of online programs offers a large number of online programs through its Worldwide eLearning program. In addition to online options, there are seven regional sites across Texas that oversee additional hybrid and non-traditional education programs. Texas Tech offers online and distance degrees and certificates at nearly every level of education, from bachelor's degrees to doctoral degrees and postgraduate certificates. Popular majors include business, psychology, and biology, though the university is historically renowned among online colleges in Texas for its agriculture sciences and natural resources education programs. Online undergraduate students may also customize their degree in integrative or multidisciplinary studies. LeTourneau emphasizes a distinct foundation in practical, hands-on learning through its online programs. The school offers more than 30 online degrees and certificates across five academic divisions: aviation & aeronautical science, arts & sciences, business & technology, education, and psychology. Distance students have full access to academic support resources on Canvas and the myLETU student portal. They may also subscribe to podcasts and/or download audio files of LeTourneau chapel services. LeTourneau has been recognized repeatedly as one of the best online colleges in Texas, and named among the best schools in the nation by U.S. News and World Report more than a dozen times. All on-campus and online programs integrate progressive learning styles with a uniquely Christian perspective, one of the historical hallmarks of the university. Dallas Baptist is considered among the best online Texas colleges for its diverse selection of academic programs. In addition to offering traditional majors in business and arts and sciences, the school offers a range of degrees and certificates in Christian ministry, education, and leadership. DBU emphasizes faith-based majors and minors throughout its more than 35 bachelor's, master's, and dual-degree options online. Distance students working in Blackboard have full access to a 24-hour help line, as well as separate tech support, specifically staffed for online learning assistance. The school was called Decatur Baptist College when founded at its original site in 1898 as the first two-year higher learning institution in Texas. Since moving to its current southwest Dallas campus location in 1965, DBU has kept its commitment to providing programs in the tradition of Christ-centered service and leadership. The first public university in Texas, TAMU is located in College Station, a city northwest of Houston. The university educates more than 62,500 students at its home campus, at branch campuses throughout the state, and at its overseas sites in Qatar, Mexico, Costa Rica, and Europe. Online students at TAMU can pursue 25 certificates, 47 graduate degrees, and one undergraduate degree. Digital learners can earn graduate degrees in fields as diverse as law, public health, engineering, science, education, and agriculture. The school's only distance education bachelor's program is its bachelor of science in nursing. Admission requirements vary by department, but all applicants to graduate school must submit GRE or GMAT scores. Hourly tuition rates also vary between departments and programs. The school emphasizes freedom of inquiry while celebrating traditions that are unique among online colleges in Texas. With sites throughout Texas' Rio Grande Valley, UTRGV is a regional university system and one of the best online schools in Texas. The state legislature established UTRGV in 2013, making it the first public university in Texas to launch in the 21st century. The school offers graduate, undergraduate, and certificate programs through distance education. Some are available fully online, while others are provided in a hybrid format. Many programs run on an accelerated seven-week semester format, but some require a traditional 16-week semester. Students still enrolled in high school may take up to 42 credits of college coursework through UTRGV's dual-credit program. The university's online programs include master's degrees in business administration, public affairs, and special education. UTGRV also offers an RN to BSN program for practicing registered nurses as well as certificates in court reporting, Spanish translation, and e-learning. Online courses use Blackboard as their learning platform. For all students -- both resident and nonresident -- UTGRV offers a tuition guarantee that helps keep prices stable from year to year. TTUHSC consists of five health-related schools -- the Graduate School of Biomedical Sciences, the School of Health Professions, the School of Medicine, the School of Nursing, and the School of Pharmacy. While the school's main campus is in Lubbock in the far northwest corner of the Lone Star State, it is also one of the many online colleges in Texas. TTUHSC offers distance education programs at all levels, from certificates to doctorates. The school's distance education degrees include an RN to BSN program for practicing nurses, a master of public health, a master of science in addiction counseling, and an MSN in nursing education. It also offers a doctor of science in physical therapy. Distance learners can enjoy resources like health insurance, personal counseling, health care, and scholarships through the school. TTUHSC participates in the National Council for State Authorization Reciprocity Agreements, a multi-state voluntary oversight committee. Two states, Florida and California, are not members. Students living in those states should contact TTUHSC before applying to determine if the school's programs meet their needs. Located in the small town of Denton, TX, UNT emphasizes online professional training and degree programs through its tech-savvy Center for Learning Enhancement, Assessment and Redesign (CLEAR). The school offers more than 25 online degrees and certificates across eight academic colleges, including information, education, and public affairs and community service. In addition to having access to academic support tools through Blackboard and the EagleConnect student portal, distance students can utilize an online resume-posting service and exclusive Texas veterans portal through the CLEAR system. UNT was the first in the U.S. to offer an online bachelor's in digital retailing and is among the best online colleges in Texas and the U.S., according to U.S. News and World Report. UH-Clear Lake offers more than 20 online undergraduate and graduate degrees and certificates. The university is one of four independently maintained online colleges in Texas within the University of Houston system, which also includes partnering Houston-area campus locations and satellite facilities. Distance students at UH-Clear Lake may choose from undergraduate and graduate degrees across four disciplines: business, education, human science and humanities, and science and engineering. With its unique location on a wildlife and nature preserve along the upper Gulf Coast, the UH-Clear Lake campus is especially attractive to aerospace/aeronautics students due to its close proximity to NASA and the Johnson Space Center. Through Blackboard the the E-Services portal at UH-Clear Lake, distance students can access online bill-pay services, academic advising, admissions counseling, and more. A&M-Central Texas began in 1999 and joined the Texas A&M system in 2009. The school educates more than 2,500 students and offers bachelor's and master's degrees. It emphasizes emerging instructional technology and has partnerships with regional community colleges, the community at large, and the military. As part of its commitment to make education accessible to all Texans, the school offers six bachelor's degrees and three master's degrees entirely online. The university's bachelor's degrees include aviation science, business management and nursing; master's degrees are available in business administration, information systems, and leadership and management. Once enrolled in a program, digital learners can take advantage of The Warrior Guarantee, a tuition program that guarantees applicable fees will not change throughout a specified period of time. UTA offers more than 15 online degrees and certificates in nursing, education, and urban and public affairs majors. UTA is among the top Texas colleges online for its esteemed online programs through the College of Nursing and Health Innovation. Distance students have full access to online tutorials and technology support through the UTA Help Desk. They may also enroll in an exclusive accelerated degree-completion program through the school's Center for Distance Education. The school offers the same affordable tuition prices, per credit hour, to all students, regardless of delivery format or geographical location. In recent years, UTA has outnumbered all other Texas schools in fully distance-education students within its online programs. South Texas offers 30 online programs through its McAllen location. From business to education to social work, online associate and bachelor's degrees accommodate both students seeking their first undergraduate degree and those looking to transfer bachelor's credits toward a degree-completion program. Distance students may use Blackboard to complete courses on their computer, or download the mobile app from the South Texas website. The school is renowned among online colleges in Texas for its extensive student support and technology services, including live-chat technical and enrollment support, online advising, and comprehensive veterans benefits. STC is the state's largest higher education institution south of San Antonio, serving over 34,000 students throughout its numerous physical locations and global campus. From associate to doctoral degrees, SAGU offers one of the largest selections of programs among online colleges in Texas, with more than 70 choices available to traditional and distance students. In addition to majors in business, psychology, and education, the school emphasizes a broad range of ministry programs in divinity, theology, and worship arts. Online students may access a live-stream of chapel services at SAGU. They may also participate online in prayer groups, and make donations from afar to support ongoing Jerusalem Prayer Watch efforts on the SAGU campus in Waxahachie, TX. All online students have access to library resources, career advising, tech support services, and more to support their online learning experience. U.S. News and World Report recently recognized SAGU among the nation's top providers of online bachelor's programs. Sam Houston State offers more than 40 online degrees and certificates through SHSU Online. The school has earned numerous awards and distinctions for quality and affordability among the best online colleges in Texas and the nation, according to U.S. News and World Report. Distance students engage in courses throughout fall, spring, and condensed summer terms. Support resources can be accessed through the Blackboard online learning platform as well as the Academic Success Center, which provides mentoring, academic tutoring options, and continuing education opportunities. Online students at SHSU have access to higher education resources provided by the state of Texas, including the Texas Veterans Portal, disability services, and Texas State Library and Archives Commission database. With four outreach locations in addition to the main campus in Stephenville, Tarlteon State's online programs reflect a variety of interests and occupations in-demand across the state of Texas. The school offers 20 online bachelor's and master's degrees in business and administration, education, health services, and more. Distance students can access online courses through Blackboard and find a range of student support resources, including tech support and financial aid assistance, through the myGateway portal. As an extended member of the Texas A & M University system, graduates of the Global Campus at Tarleton State University are afforded the same valuable and prestigious diploma as their A & M counterparts. The school is among the best online colleges in Texas for providing scholarships for teacher education. Tarleton boasts a nearly 100% placement rate for IT graduates and a 98% teacher-certification pass rate among its select technology and teacher licensure programs available online. UT at Tyler offers more than 15 online degrees across four academic divisions: nursing and health sciences, education and psychology, arts and sciences, and business and technology. The school also offers a degree-completion program in applied arts and sciences through its professional-studies-oriented University College. Distance students have full access to academic support resources in Blackboard and through the Academic Success Center. They are provided electronic library access, IT support and online chat opportunities through the myUTTyler portal. Adding to its designation as one of the best online Texas colleges, the university is also the only one in Texas to host three distance learning campuses for students off campus. UTPB emphasizes a global perspective throughout its academic programs, designed for both domestic and international online students. The school offers more than 20 online bachelor's and master's degrees across arts, science, business administration, and nursing fields. Many of these undergraduate programs are offered through an accelerated eight-week format. UTPB is among the best online Texas colleges for its comprehensive selection of degrees and courses offered in conjunction with the University of Texas Online Consortium. Online and on-campus students are offered the same diverse student support resources to enhance the learning experience, including tutoring, counseling, IT services, career advising, and more. Located in San Antonio, Hallmark University specializes in aeronautics, information technology, business, and healthcare programs. Since its founding nearly 50 years ago, Hallmark equips students with the practical skills needed to succeed in nearly half the time and at a lower cost than traditional 4-year institutions. Hallmark University has a strong focus on outcomes in their institution, such as their 90 in 90 placement goal which aims to place 90% of graduates in jobs within 90 days of their graduation. Their online program is one of the best in Texas and is receiving new programs while expanding the university's offerings online. Hallmark University offers five programs online in each area of study in addition to multiple on-ground programs located at both of their campuses. Hallmark's graduate offerings include a master of business administration in global management and a master of science in strategic leadership from their business school. Hallmark provides its online students with a digital library and technical support, including help with Blackboard, the school's online education platform. Cost per credit hour varies depending on the program. The school holds accreditation from the Accrediting Commission of Career Schools and Colleges, along with approval to operate from the Texas Higher Education Coordinating Board. The College of Aeronautics at Hallmark University is approved by the Federal Aviation Administration. Texas A & M University offers online degree programs through its Commerce campus in either online or hybrid online/on-campus formats. The school offers nearly 50 undergraduate, graduate, and post-graduate programs in business, science, education, engineering, agriculture, and more. Distance students can access 24/7 tech support for the Pearson Learning Studio platform or other IT issues, as well as seek tutoring, library tools, and other resources provided by the Academic Success Center. 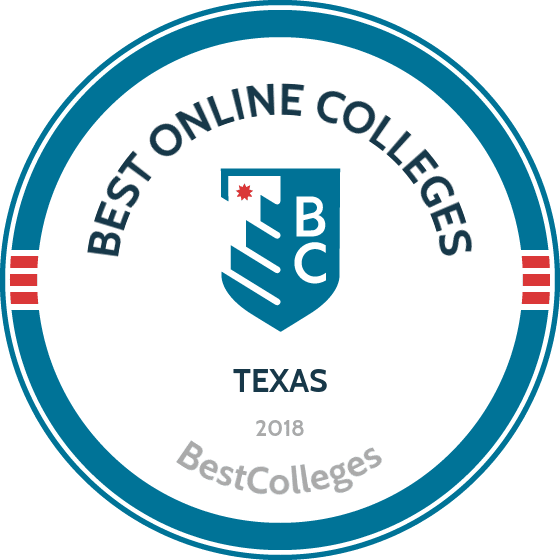 The school is recognized among the best online colleges in Texas and nationally for its innovations in higher education, incorporating Web-enhanced technologies and ITV platforms to deliver content remotely through its satellite locations. Texas Woman's University maintains physical campuses in Denton, Houston, and Dallas, and supports more than 20 online and hybrid programs. The school offers online certificates and degrees for undergraduate, graduate, and post-bacc students, as well as PhD candidates in business, education, and general studies. Among the best online Texas colleges for student support, distance students have full access to online school and state resources, including College for All Texans financial services, Texas Veterans Portal, and other consumer sites. TWU offers a secure billing center online for all students to access their student accounts 24/7, make payment plan arrangements, and more. With more than 15,000 students overall, the university is the largest of those primarily for women in the U.S. Created by Dr. Jack Hayford, pastor of the Church on the Way, and Robert Morris, pastor of Gateway Church, TKU is an evangelical Christian school serving more than 700 students in Texas and around the world. The university holds accreditation with both the Transnational Association of Christian Colleges and Schools and the Association for Biblical Higher Education. Students at TKU can earn undergraduate, master's, or doctoral degrees and can pursue a variety of emphases including one in messianic Jewish studies. Seven of these degrees are available online. Applicants to TKU need to show the potential to thrive academically and spiritually at the university. Once enrolled, students take classes such as spirit-formed life, Old Testament survey, and sermon preparation. Undergraduate students must also engage in approved hands-on ministry while they are part of TKU. As is the case at many online schools in Texas, students must complete capstone courses and internships as part of their programs. West Texas A & M University offers nearly 20 online degree programs in fully online and hybrid formats. Majors and minors span five primary areas of study: business administration, criminal justice, health sciences, nursing, and education. Distance programs provided through the West Texas location are directed by the Texas A & M system, the second-largest university system in the world. Support for online learning is provided by the Student Success Center and includes academic advising, counseling, and tutoring services. Online students can also seek assistance arranging internships, study-abroad opportunities, and national scholarships through advisors dedicated to distance learning. WTAMU has received consecutive awards and rankings among the best online colleges in Texas and the nation for business, MBA, veterans programs, and more, according to U.S. News and World Report. UST educates students as part of the Catholic higher education tradition. Founded 70 years ago, UST now enrolls more than 3,000 students in Houston, in cities around the world, and as one of the top online colleges in Texas. Students at UST study medicine, public administration, education, or business in one of 35-plus undergraduate majors or 20-plus graduate degrees. These include options for adult learners to finish their bachelor's degrees. Students older than 25 who have at least 60 transferable credit hours with a 2.5 cumulative GPA or better can earn degrees in business, general studies, early education, or criminology. Students can transfer up to 72 credits from two-year colleges and 90 credits from four-year colleges. UST even offers special scholarships exclusively for transfer students. All of UST's bachelor's degrees require core courses in subjects like theology, English, natural sciences, history, fine arts, and math. Available majors for adult students include accounting, marketing, and teacher education. UTEP offers 16 degrees and certificates online through its UTEP Connect division. The school offers bachelor's and master's degrees in a number of unique majors, including an MEd with a concentration in bilingual education, a BA in security studies, and a customizable multidisciplinary studies degree. Four comprehensive degrees are available online through UTEP's own School of Nursing, including an RN to BSN option. UTEP's online programs reflect the school's history of more than 100 years among the best online colleges in Texas for U.S.-Mexico border communities, creating online degrees and certificates according to workforce demand where the El Paso campus is located. Distance students are assigned an enrollment counselor and student success advisor for the duration of their online learning experience. Comprehensive online student support is a hallmark of distance programs at UTEP, providing disability services, career guidance, tech support, tutoring, and more. Midwestern State emphasizes nursing and health sciences through more than 15 degrees and certificate programs offered online. Distance students complete coursework in D2L and have full access to support resources provided by the distance education division, including career management, counseling, and academic advising. The school offers a comprehensive distance education orientation course, as well as hundreds of additional support tools via the myMWSU student portal. MWSU extends a special discounted tuition rate to non-Texas residents studying online, ultimately paying only $65 more per credit than Texas residents. Midwestern's physical campus in Wichita Falls bears the unique distinction of being equal in distance to Dallas-Fort Worth and Oklahoma City. If you want to qualify for a range of high-paying job opportunities, earning a college degree is key. When deciding where and what you want to study, you may end up weighing both in-state and out-of-state schools. If you are from Texas, there are many advantages to attending college in your home state. Sticking close to home can qualify you for in-state tuition and help you build a network of regional professional contacts. You may also benefit from your school's name recognition on the local job market, and you'll be relatively close by if you need to occasionally visit campus. When researching programs, be sure to consider our list of the most affordable online colleges in Texas. All of the schools in this list are accredited, and our rankings highlight the colleges that offer the best blend of affordable tuition and return on investment. One of the top colleges in Texas, the University of Houston - Victoria boasts a large catalog of on-campus, hybrid, and remote academic offerings, which range from certificates to full degree programs. Students who want to pursue an online education can choose from degrees in fields like supply chain management, autism spectrum disorders, global business, and creative writing. Admissions criteria for first year students include a minimum 2.0 high school GPA and an 18 on the ACT or 860 composite on the SAT. The affordable tuition rates are priced based on degree type and residency status. Located in Denton, Texas Woman’s University boasts a strong distance education platform. Approximately half of TWU’s degrees can be completed entirely online; the remaining half are structured in a hybrid format, requiring varying degrees of on-campus engagement. Notable online degrees include dental hygiene, education of the deaf, drama, teaching, and family studies. Though the majority of the university’s academic offerings center on the academic and professional empowerment of women, several of the school’s programs welcome enrollment by men. Due to its low tuition and dedication to serving students’ financial needs, TWU ranks as one of the most affordable online colleges in Texas. The University of Houston in Clear Lake provides nontraditional learners with 20 online certificate, undergraduate, and graduate programs. Students who want to earn a bachelor’s may choose from general business, finance, anthropology, or public service leadership, while master’s degree candidates have options in fields like software engineering and environmental science. UHCL stands out among other colleges in Texas for the depth of resources and services provided to online students, which include career and health counseling, tutoring through the Student Success Center, and opportunities for professional growth via club involvement and volunteerism. Students residing in Pennsylvania, Wisconsin, the District of Columbia, and Puerto Rico are not eligible for online study. Established in 1927, the University of Houston is one of the top colleges in Texas. The school has more than 270 academic programs, many of which are offered to distance learners through Blackboard. With a large selection of programs -- including civil engineering, hospitality management, and African American studies -- UH has a program for nearly every student. Like their on-campus peers, distance learners enjoy university support, such as subject tutoring and writing help, counseling and psychological services, and financial aid opportunities, including additional assistance for active military personnel and veterans. Since 1974, the University of Houston - Downtown has provided academic programs focused on career preparation. Today, UHD Online offers many of those same opportunities to distance learners, including bachelor’s degree completion tracks in fields like professional writing, applied administration, and insurance and risk management. Graduate students will also find several fully accredited master’s programs to choose from. Because these are completion programs, prospective students are expected to have already completed a certain number of transferable hours. Online students at UHD enjoy small class sizes and quality instruction identical to on-campus classes. Online students are eligible for low tuition rates and financial aid, making UHD one of the most affordable online colleges in Texas. Located in Odessa, the University of Texas at the Permian Basin offers distance education opportunities for US residents and international students. The school has several fully accredited degree programs in areas like sociology, nursing, and public administration. UTPB is a leader among online colleges in Texas for the breadth of its education programs, which enable teachers to acquire bachelor’s and master’s degrees, as well as professional certificates in superintendency and early childhood developmental disabilities. To accommodate busy work schedules and urgent career goals, many courses can be taken in an accelerated eight week format. The University of Texas at Tyler's distance education platform supports fully online degrees and HyFlex (hybrid) programs that require some on-campus attendance. Students can choose from bachelor’s and master’s programs in areas such as English, school counseling, and industrial management. UT Tyler also provides mid-career business professionals the ability to earn executive degrees in specialized topics like public relations and human resource development. Distance learning is facilitated through Canvas. Classes are asynchronous so students can access materials and complete assignments with a great degree of flexibility. With low tuition rates based on residency and ample financial aid options, UT Tyler is one of the most affordable Texas universities. Located in Denton, just one hour northwest of Dallas, the University of North Texas is one of the largest providers of online education in the state, with 18 certificate programs, 26 degree pathways, and more than 100 remote classes. Those interested in earning an online bachelor’s degree should know that the school only offers degree completion programs, which means prospective students must transfer in general education and major prerequisite credits from another college. Graduate candidates may enroll in accelerated degrees which can be completed in as little as 12 months. Like other affordable Texas universities, UNT tuition is low and distance learners can apply for financial aid. Hallmark University has been providing career-focused academic and professional training programs since 1969. Today, the school accommodates distance learners with online classes and fully accredited degrees in the fields of healthcare, information technology, business, and aeronautics. One notable program is a master of business administration in global management, which prepares students to lead their teams in assessing financial risks and navigating the international economy. Hallmark prides itself on low tuition rates, which, coupled with the school’s numerous scholarship resources, makes it one of the most affordable colleges in Texas. Distance learners can also take advantage of Hallmark’s student resources, including the resume building and networking workshops facilitated by Career Services. Located in Wichita Falls, Midwestern State University offers online academic programs in a variety of fields, with special focus on the health service industry. Students can complete bachelor’s and master’s degree programs in nursing, respiratory therapy, healthcare administration, and radiologic sciences. The school also offers degrees in fields like criminal justice and instructional technology. MSU is one of the most affordable online colleges in Texas, with distance learners paying the same low tuition rates as their campus peers. Online students also have access to financial aid, including scholarships for distinguished academic performance. Though the majority of MSU’s online programs have nationwide authorization, out-of-state students should confirm that they are eligible to enroll in their desired program. With advanced research facilities and diverse student and faculty populations, the University of Texas at El Paso offers accessible academic programs through their online school, UTEP Connect. The school offers seven online bachelor’s degrees, five master’s degrees, and three graduate certificates. Notable programs include bachelor’s degrees in corporate communication and Chicano studies, and master’s degrees in systems engineering and bilingual education. Tuition rates are priced based on residency status. Financial aid is available to online students, making UTEP one of the most affordable colleges in Texas. Because many students come from underserved populations, the university emphasizes personalized guidance, including admissions counselors and student success coaches to help students through the entirety of their program experience. Through its Office of Distance Education and Instructional Technology, the University of North Texas at Dallas provides fully online and hybrid classes ranked highly for their academic excellence and engaging design. Students can choose from nearly 200 courses, including environmental studies, urban sociology, computer security, and human nutrition. With the help of an academic advisor, students can complete the majority—if not all—of their chosen degree remotely. UNT Dallas is one of the most affordable colleges in Texas, offering financial support and a fixed tuition plan for all online students. Located in Lubbock, Texas Tech University offers a variety of distance education options through its Worldwide eLearning initiative. This includes online and hybrid courses as well as full degree and professional training programs. Students may choose from seven online undergraduate programs, 24 online graduate programs, and seven online doctoral programs, including in architecture, early child care, mechanical engineering, and English. TTU even provides remote classes designed specifically for those over the age of 50, which eschews testing and grades, focusing instead on developing skills and pursuing knowledge. As one of the most affordable colleges in Texas, TTU provides affordable tuition rates and financial aid opportunities, including scholarships designated for those transferring from a community college. Sam Houston State University's lauded distance education programs range from certificates to doctoral degrees. In addition to options such as nursing, business administration, and sustainable agriculture, SHSU has one of the best criminal justice master’s programs among colleges in Texas. Geared towards experienced professionals, this two year degree emphasizes career advancement and prepares graduates to obtain top positions in law enforcement and social services. Distance learners receive university support services, including financial assistance like the 60x30 scholarship, which automatically awards new, fully online graduate students $1,000. Located in San Antonio, Trinity University offers over 100 majors and minors. Trinity has several fully and partially online classes, which students can use to supplement their on-campus coursework. Online classes lower overall degree costs and allow students to have more time for other pursuits. With the right planning and transfer credits, students can even complete entire degrees online. All students benefit from Trinity’s small class sizes and support network, which includes academic advising and tutoring through the Student Success Center. Trinity is one of the most affordable Texas universities and over half of students graduate with no debt. Texas A&M University provides distance learning opportunities for Texas residents and out-of-state students. TAMUC offers several online degree programs, including 100% online, mostly online, and hybrid programs. Options include business administration, computer information systems, physics, and agricultural sciences. Students can plan for their lives after graduation with the help of Career Services, which also provides internship opportunities and job building workshops. TAMUC is one of the most affordable colleges in Texas, providing distance learners with flexible tuition plans and financial assistance, including scholarships for top performing high school students. The Cedar Hill campus of Northwood University focuses on the field of business. The school offers flexible degree options that include online classes and remote degree programs. Undergraduate students can earn a bachelor of business administration completely online with majors in areas like finance, entrepreneurship, and automotive marketing and management. Those who wish to pursue a graduate degree can apply for the Devos Graduate School’s online MBA program, preparing themselves for mid-level and top-level management positions in the global business market. Northwood is one of the most affordable colleges in Texas because of its low online tuition and ample scholarship opportunities, including generous awards for adult learners who want to complete an undergraduate degree. Since 1898, Dallas Baptist University has educated every kind of student, from recent high school graduates to experienced working professionals. Today, DBU offers more than 100 degree programs, including online undergraduate programs in sociology, psychology, Christian ministries, and business. Students can find even greater variety among online master’s and certification programs. Online learning is facilitated by Blackboard. Hybrid classes are available for students who want to take some classes on-campus. DBU ranks as one of the most affordable online colleges in Texas, with tuition rates dictated by degree type and not residency status. Located in Stephenville, Tarleton State University is an hour southwest of the Dallas/Fort Worth area. The school offers a wealth of academic programs through its eleven colleges, including 20 online degree pathways. Choices include, but are not limited to, bachelor’s veterinary technology, industrial management, music education and agriculture and consumer resources. TSU is one of the most affordable online colleges in Texas and boasts a strong student support network. Distance learners can access the school’s internship, service learning, and study abroad opportunities. The University of Texas Rio Grande Valley was established in 2013 as an institution dedicated to innovative education and career development. Prospective students may access fully online bachelor’s and master’s programs in subjects like business administration, educational technology, and Spanish translation and interpreting. Students have the option to accelerate their degree plan to graduate faster. UTRGV provides hundreds of classes and training courses for distance learners, making the school a leader among online colleges in Texas. Tuition for select programs caps at 12 hours, meaning students can take additional credits for no extra charge. Located in Canyon, West Texas A&M University contains some of the most highly ranked distance education programs in the US. Offerings include hybrid and 100% online degrees in areas such as health sciences, instructional technology, and nursing. As part of The Texas A&M University system, students enjoy a wealth of academic and professional resources as well as the ability to easily transfer credits and take classes within any member institutions. WTAMU is one of the most affordable online colleges in Texas, providing not only loan and scholarship opportunities, but also a guaranteed tuition and fee plan for all incoming undergraduate students. Wayland Baptist University enrolls 5,000 students annually in its campus and distance education programs. For recent high school graduates, WBU offers associate degrees in general studies and applied sciences, enabling students to easily transfer credits into future bachelor’s programs. WBU also provides online bachelor’s, master’s, and doctoral degrees in fields like history, business management, and nursing. All students enjoy a fixed tuition rate regardless of their residency status. Accessible financial aid, including a scholarship for law enforcement professionals and their families, makes WBU one of the top affordable Texas universities. Located near the U.S.-Mexico border in the city of McAllen, South Texas College works hard to provide academic and professional training to its diverse student population, many of whom are the first in their family to pursue higher education. Through its Virtual Campus, STC offers 32 online programs, including associate and bachelor’s degrees in anthropology, education, computer science, and organizational leadership. Tuition rates are based on three residency categorizations and overall prices are some of the lowest among colleges in Texas. Online students can access financial aid, including scholarships for those pursuing a STEM career and those with dependents. Remington College’s Fort Worth campus offers accessible and career-oriented academic programs, many of which are offered online through the Canvas Learning Management system. Distance learners will find over 100 continuing education courses as well as degrees in management, health services, legal professions, and business administration. Tuition rates are low and students are guaranteed a fixed rate as long as they make continuous progress towards their degree. Because of its scholarship options and military benefits, Remington is one of the most affordable online colleges in Texas. All students have access to the school’s support network, which includes networking and professional development opportunities through the Reach Out initiative. Located in Longview, LeTourneau University provides online degree programs that can be completed at an accelerated pace, a great fit for working professionals eager for career advancement. In addition to bachelor’s and master’s options in subjects like business administration and educational leadership, LETU stands out among other online colleges in Texas for its aviation studies and management programs. These programs prepare students for work as professional pilots, flight operation specialists, and other related positions. Distance learners pay a flat and affordable tuition rate based on their program, regardless of where they live. Financial assistance is available, and nearly 90% of LETU students receive financial aid. As the second largest state in both size and population, Texas has a large number of distance learners attending its 146 institutions of higher education. A total of 1,573,627 students enrolled in programs delivered entirely online in fall 2012; the second highest amount in the country. In 2011, over 528,000 students attended via community colleges, while approximately 240,000 enrolled from public, 4-year institutions. These numbers continue to rise; between 2006 and 2011, distance learning programs at public universities in Texas grew at a rate of 87%, while community college enrollment rose 58%. State funding for education in Texas increased 4.4% in the 2014-2015 school year to reach $15.7 billion; this money contributes to the growth of online education in the state. The rate students pay for distance learning tuition can fluctuate greatly. In 2012, 72% of the districts that responded to the Legislative Budget Board survey reported unique fee charges to online learners, while 26% reported fee exemptions. Though both funding and fees change each year, distance learning continues its steady rise in popularity. As the prevalence of online college programs grows in Texas, so will the resources dedicated to bettering it. Browse our list of the best online colleges in Texas for more insight into distance learning programs in this state. Recent NCES reports show that 8.9% (139,737) of all students enrolled in Title IV institutions in Texas were in exclusively online programs. In Texas, employment growth in this professional area is strong. According to the Texas Labor Market & Career Information Department, long term projections show an increase of 17% in the total number of jobs relevant to this field between 2014 and 2024. Wages increased by 19% among degree-related careers from 2011-2016. What were the top careers in Texas in 2016 for people who had a degree in business administration and management? Data source: Texas Labor Market & Career Information Department, Bureau of Labor Statistics. Data may not be available for every year. In Texas, employment growth in this professional area is strong. According to the Texas Labor Market & Career Information Department, long term projections show an increase of 36% in the total number of jobs related to this field between 2014 and 2024. Wages increased by 4% among nursing-related careers from 2011-2016. What were the top careers in Texas in 2016 for people who had a degree in registered nursing? In Texas, employment growth in this profession is poor. According to the Texas Labor Market & Career Information Department, long term projections show a decrease of 14% in the total number of available, relevant jobs between 2014 and 2024. Wages increased by 15% among degree-related careers from 2011-2016. What were the top careers in Texas in 2016 for people who had a degree in criminal justice/safety studies? In Texas, employment growth in this professional area is moderate. According to the Texas Labor Market & Career Information Department, long term projections show an increase of 8% in the total number of jobs relevant to this field between 2014 and 2024. Wages increased by 10% among relevant careers from 2011-2016. What were the top careers in Texas in 2016 for people who had a degree in psychology? In Texas, employment growth in this professional area is strong. According to the Texas Labor Market & Career Information Department, long term projections show an increase of 40% in the total number of jobs relevant to this field between 2014 and 2024. Wages increased by 17% among relevant careers from 2011-2016. What were the top careers in Texas in 2016 for people who had a degree in marketing/marketing management?